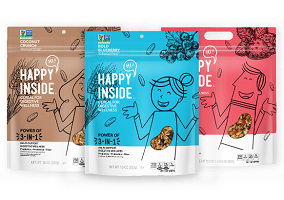 Cereal and snacks giant Kellogg has announced the launch of a new “3 in 1” cereal brand that claims to makes digestive health support “easily accessible”. HI! Happy Inside cereal is described as containing a blend of prebiotics, probiotics and fiber to provide support for good gut health. The range is claimed to contain a blend of fruit, yoghurty pieces and whole grains that stay crunchy in milk, and is available in the varieties Simply Strawberry, Bold Blueberry, and Coconut Crunch. Commenting on the launch, HI! Happy Inside marketing director Aleta Chase said: “HI! Happy Inside is a delicious cereal with three powerful ingredients to support digestive wellness. This new cereal provides a proactive real food solution to people who want to incorporate more prebiotics and probiotics into their diet”. The cereal is being sold in 34.5oz resealable bags as well as single serve cups for an RRP of $12.99 and $1.99 respectively.